I have a confession to make. Despite all my crowing about making it as a single girl homeowner (choose the appropriate hyphenation), I’m not so single anymore. For the last 15+ months, I’ve been dating the wonderful Don (“The Don,” as friends call him), and two weeks ago, he moved in. It’s been fantastic sharing my home – our home – with such a caring, loving guy who constantly challenges me to be a better version of myself and do more. In fact, the Cinderella concept stems in part from him. One night several months ago, I was talking about all the things I’ve learned as a novice homeowner and the advice I give to friends. He encouraged me to keep at it, write it down and do something with the concept. That idea, coupled with Colete Dowling’s Cinderella Complex, gave rise to this blog and numerous other scattered writings. The truth is, it’s great having a roommate who not only helps with the mortgage (thus freeing up funds to do more projects and – gasp – go back to school) but also serves as a sanity check on some of my more harebrained ideas. Climbing up on the roof alone? No way, not with Don around. He acknowledges that I certainly can do many things alone, he’s there, ready to help out while also injecting some reason and rationality into the process. 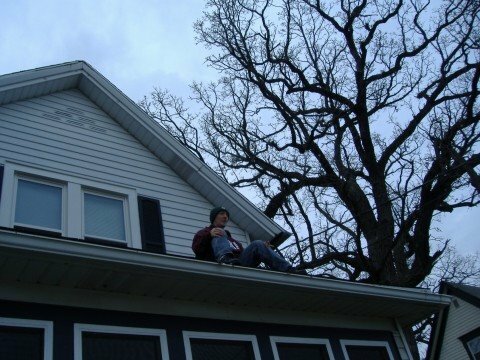 Heck, last fall he climbed the roof to help me clean gutters, despite his fear of heights! If that’s not love, I don’t know what is. Though he hates – HATES – my rotary lawnmower, so that job happily remains mine. Overall, I’m so lucky to have found such a great guy to share my life and home with. I just hope he realizes what he’s in for on the DIY front! This entry was posted in Blog Status and tagged Big Picture, Girl Power, Neighbors. Bookmark the permalink.